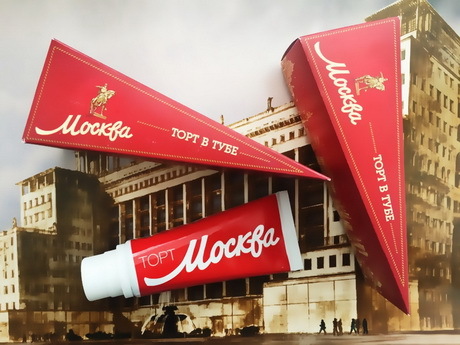 Moskva Cake in tubes hits the market next week, m24.ru reports with a reference to Andrei Vedernikov, the head of the Research and Production Laboratory of Special Nutrition. The famous cake in tubes will be available in souvenir stores at the VDNKh, the Moscow Planetarium and in stores where they sell traditional cakes. The culinary symbol of the city, Moskva Cake is the favorite delicacy of local residents and guests of the Russian capital. We have created a technology that allows extending the shelf life of the cake, preserving its original taste. The dessert is packed in a tube, which originally was designed for space food,” Mr Vedernikov explains. The cake in tubes of 100 g is made by the classic recipe. Each tube can be stored for three months. Prices for this products are to be determined by stores. The product will be available to visitors of the VDNKh, the Moscow Planetarium and stores where it is sold. Moskva Cake in tubes will also be offered to guests of seasonal city festivals. Alexei Nemeryuk, the head of the Department of Trade and Services, says that so far they plan to test a trial batch of Moskva Cake in tubes. “This is a new version of the traditional cake. First, we will test it to see how to proceed with its marketing in the future,” he adds.